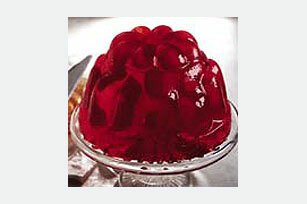 This jewel-tone JELL-O & Juice Mold is so gorgeous it could be the centerpiece of your holiday dessert buffet. Bonus: It's a Healthy Living recipe! Add boiling water to gelatin mix in medium bowl; stir 2 min. until completely dissolved. Stir in juice. Refrigerate 1-1/2 hours or until thickened. Stir in fruit; spoon into 6-cup mold or bowl sprayed with cooking spray. Refrigerate 4 hours or until firm. Unmold just before serving. Prepare using 2 pkg. (3 oz. each) JELL-O Gelatin (any red flavor). Do not use fresh or frozen pineapple, kiwi, papaya or guava juice since enzymes in these fruits prevent the gelatin from setting. Substitute cranberry juice cocktail for the orange juice.